The Southern Michigan Railroad Society was formed in 1982, with the purpose of acquiring Conrail’s Clinton Secondary Track from Lenawee Junction to Clinton, Michigan for use as a museum railroad. The track would come later; initially the SMRS needed to drum up enthusiasm for the project and raise funds. We prepared a 15-minute dual-projector slide show with music, with images of the line in Conrail days provided by Ed Hodges of Tecumseh. The show was taken “on the road” to various clubs and organizations around Lenawee County and beyond (Rotary, chambers of commerce, VFW, city governments, etc.). At the end of each presentation, a question-and-answer session was held, and membership brochures were given to all. The booth is here being manned by John Shaw, Celia Davison, and Dale Pape. On offer in that year was a raffle. 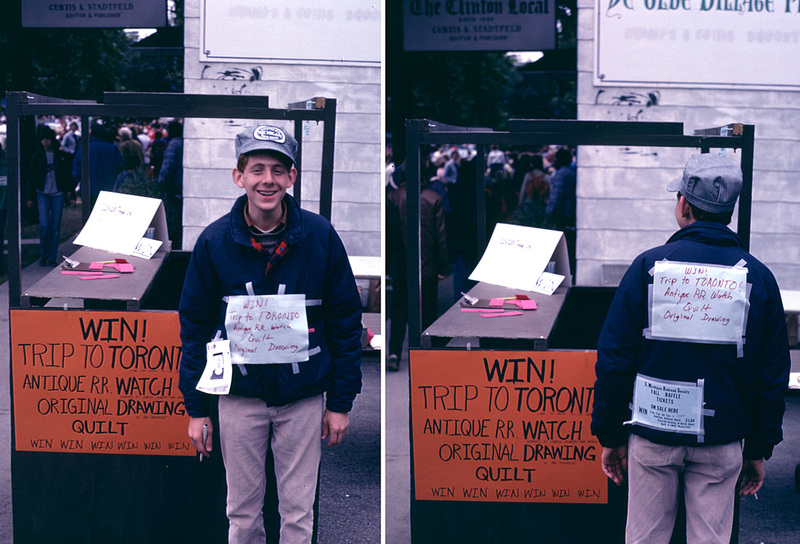 Two of the prizes were a trip to Toronto by VIA Rail, and a framed original line drawing of the Tecumseh North Depot, donated by Tecumseh artist Janet Trowbridge. There was a third price, in that open box on the counter—a pocket watch, perhaps? A stack of brochures sits under the telegraph insulator! 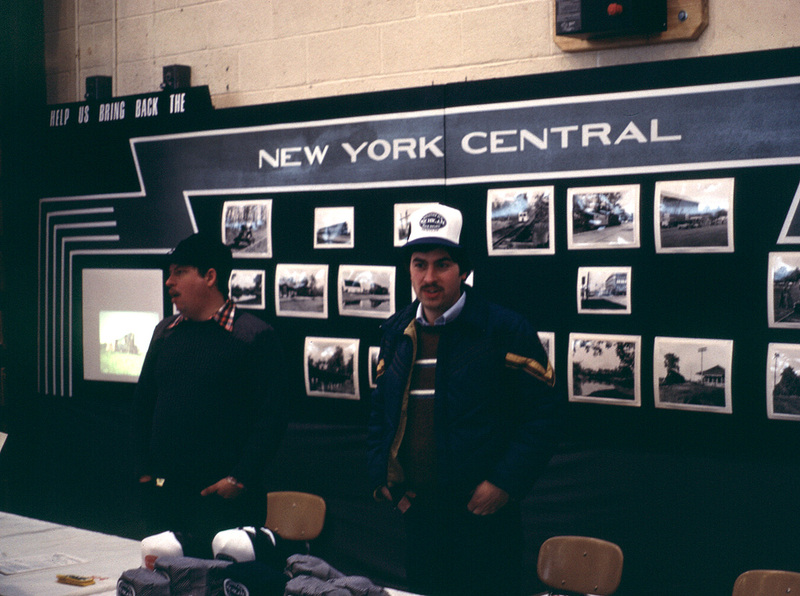 In early 1985 a larger promotional stand was built: a backdrop with the New York Central “lighting stripe” and a place to display photographs. This was more eye-catching, as it stood out when viewed from across the room. 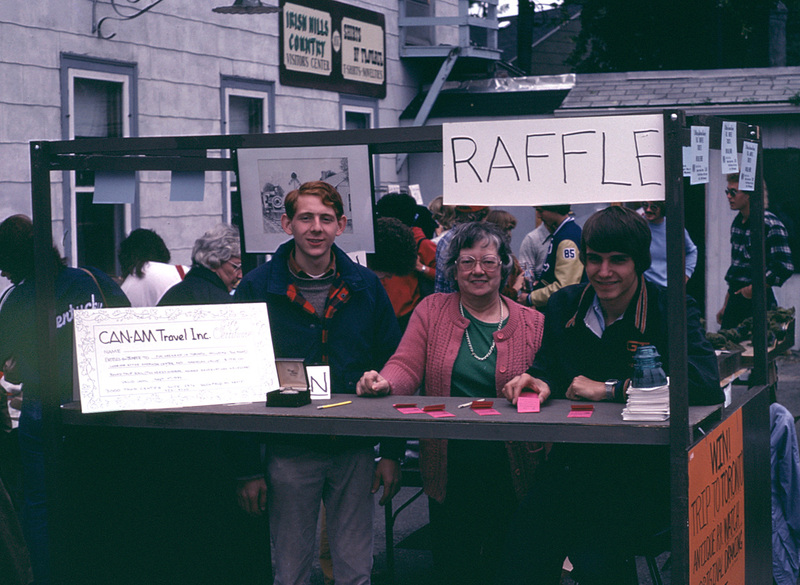 This stand was used at train shows, such as the annual Ann Arbor Model Railroad Club flea market. As you can see, fund-raising at this point had extended to the sales of caps, t-shirts, sweatshirts, mugs and other paraphernalia. It all brought in much-needed funds for the Society. The SMRS-wear was actually made in Celia Davison’s t-shirt shop, which doubled as the Society office! By mid-1985 the rail line had been purchased, and publicity efforts started to move from fund-raising to promoting rail operations.